I notice I'm constantly stepping right to correct my rollerskis wanting to track left. Is there an adjustment to fix this? Should I rotate the tires? Also, I'm considering a new set of rollerskis and was wondering the best binding/boot set-up to minimize "ski drop" where the ski/rollerski hangs or droops far from the heel. I'm imagine the SNS set-up minimizes this since there is a 2nd bar holding the boot to the binding but what about for NNN boots/bindings? 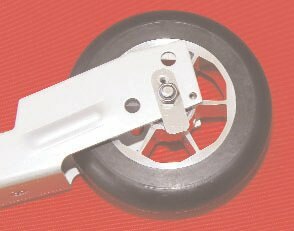 dcpattie wrote: I notice I'm constantly stepping right to correct my rollerskis wanting to track left. Is there an adjustment to fix this? Should I rotate the tires? dcpattie wrote: Also, I'm considering a new set of rollerskis and was wondering the best binding/boot set-up to minimize "ski drop" where the ski/rollerski hangs or droops far from the heel. I'm imagine the SNS set-up minimizes this since there is a 2nd bar holding the boot to the binding but what about for NNN boots/bindings? Michael_A wrote: Loosen front and rear axles, clamp both wheels between two straight boards, then tighten axles and wheels will be parallel = go straight. This is how the Siriro device work. No, the tail will not always be heavier. Please explain how moving the bindings back makes the tail drop more. Sorry, what I meant is that moving the bindings back 3” might cause bigger problems than having the back wheel dropping a little. Michael_A wrote: Sorry, what I meant is that moving the bindings back 3” might cause bigger problems than having the back wheel dropping a little. That depends on how far in front of the balance point the bindings are. Dave is tall and I presume his feet are not very small. In any case, with a new pair of roller skis with shafts or frames 60 cm long he should be able to get a nicely balanced setup. Basically loosen the screw and push the little tab to move the wheel. Of course to align it to the rear a tool like Magnus has suggested would be the best, but you could at least sort the worst of it by eye alone. To do the other axis you must bend using force. I'm a bit fed up with Jenex due to fork design easily becoming misaligned. Next ski will be Swenor type with 'box' forks. Thanks - this works. This truly is a "micro-adjustment", I made an adjustment before heading out and was quickly veering off the trail. Just the slightest movement makes a HUGE difference! It took me about another hour of iterative micro-adjustments to dial it in.